Houston divorce attorney John K. Grubb advises business owners and corporate executives regarding the precautions they can take with a business if they are preparing to get married, already are married, or are beginning divorce proceedings. 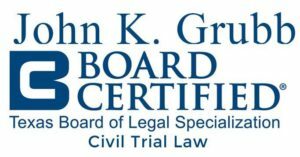 John K. Grubb is a high asset divorce lawyer who has been representing clients with significant business and corporate assets for over 30 years. He is board certified in Civil Trial Law by the Texas Board of Legal Specialization with an MBA in accounting and finance. A business is an important asset for a family; it may be the largest asset that a couple or an individual spouse owns. For many families, it is extremely important that the business stay in the family. Consequently, if a marriage involves a family business, then that alone is a good enough reason to discuss what to do with the business if the marriage ends. That is because a divorce could be disastrous for a family-owned business. Statistics show that less than a third of family businesses survive from the first generation to the second. Less than a third of those survive from the second to third generation. Barely any make it to a fourth generation. While there are multiple causes for businesses to fail, a primary one is poor estate and family planning. One example is failing to take into account the effects of a divorce. Houston family law attorneys can advise you regarding the precautions you can take with your family business. This is important if you are preparing to get married, already are married, or are beginning divorce proceedings. Business owners and their spouses face unique problems in a divorce. Many times the business is a combination of corporations, partnerships, limited liability companies, limited partnerships, and investment in specific assets. While the parties may refer to it as one business, legally there are really a number of different entities and assets. These then frequently have interlocking and interdependent parts. You need to identify these, trace and explain them and then value them. Frequently it is necessary to work with accountants, financial consultants, and valuation experts to property identify and value the party’s business interest. Corporate executives frequently have a number of different assets (in addition to 401k and pensions) to take into account. Some of these benefits consist of stock options, employee stock option plans, restricted stock plans, phantom stock plans, deferred compensation, long term incentive plans, profit sharing plans, bonuses, annuities, non-qualified retirement plans, and contractual payments. You then have to address each one of these assets in the divorce. In many cases, you should work with the corporate executive’s human relations department to fully understand and value the plans. In other cases, outside compensation companies administer these benefits and you must must consult with them. Selecting an expert. The divorcing parties must agree on an expert to perform the business evaluation. The expert should be impartial and independent. It can be useful for the couple to have a neutral, third party mediator select the expert who will perform the appraiser. Otherwise, the divorce proceedings could carry on too long. In these cases, each side questions the other’s valuation until a court makes a decision that could favor no one. Performing the valuation. It is best to leave the actual valuation to the expert. However, it will involve a complex calculation using the business’s assets and income to predict its future value. Frequently, the appraiser will analogize the business to others of a similar size and history to predict what worth the business might have. Additional Questions About Business in Divorce? Contact a divorce attorney in Houston at John K. Grubb & Associates, PC to discuss the effects of a divorce on your business.